Homeowners options for dining room lighting installations are nearly as varied as the dining rooms they populate. So when you’re making your dining room lighting choice it’s easy to feel overwhelmed. According to the recommendations set forth by the American Lighting Association, the trick is to measure your dining table first. You should match the measurement of the fixture to the total height of the room. Adding one inch of height to your lighting choice for every foot (above 8ft) of your ceiling. Ideally you’ll want the light to hang ⅓ of the total height of your ceiling. Afterwards, the rest is up to personal preference and usage. When choosing a chandelier, the recommendation is to go with a model measuring twelve inches less in diameter than the table’s smallest width. And the recommended height for an average eight foot room is to let it hang 30 inches, but if you or your guests are tall, you can always set it higher. It’s important to always fit the chandelier to the room’s unique proportions. 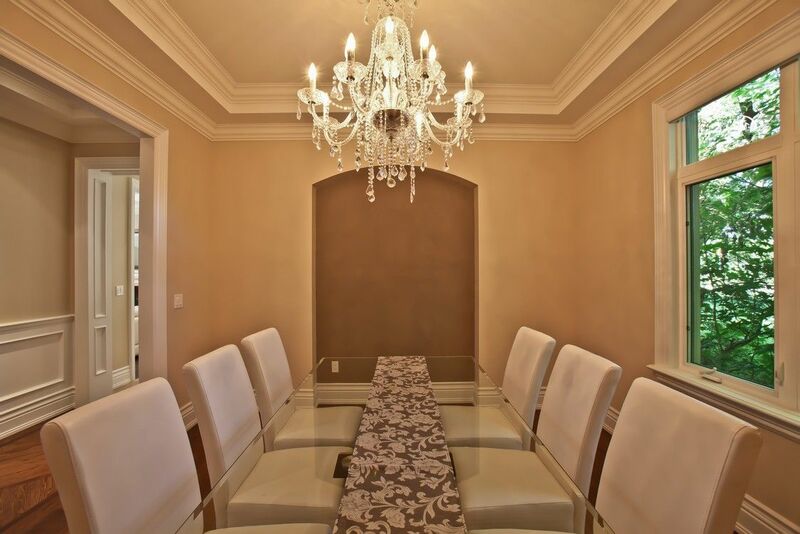 For instance, an oblong chandelier can be risky when paired with a long table, or a table with folding leaves. Many home fashion experts agree that the chandelier is best paired with a round table. Far less common than the chandelier (for large dining rooms), the traditional wall lamp provides a great source of light at the cost of aesthetics. However, this limit on atmosphere in your dining room can be counteracted by adding candles, be they wax or electric. It should also be noted that linear lights compliment square or rectangle tables the best. Your lighting designs level of visibility should always be the first thing taken into consideration, as even models of the same size can produce completely different lighting patterns. This is especially true in comparisons of older and newer lighting fixture models. A more modern chandelier with informal starbursts using light-emitting diodes will appear to spread out in a wider gap rather than a traditional crystal chandelier. Always a popular option, the dimmer switch allows the most control over the ambiance of your dining room. Everything from a way to set the mood of the room, to a date night in with your spouse, can be tackled with a dimmer switch. Just be sure to remember that not all makes and models are compatible, and not every outlet can support the installation. Experts agree that there are two methods of thinking to take into consideration: horizontal and vertical perception. Horizontally creates layers of light to enjoy, while vertical lighting design results in columns of visibility instead. Recessed light and wall scones are two primary examples of layering these styles of lights to create a new, fresh look. Overall, you have the last say! Whether you want to experiment with new models and lighting layers, or take the more traditional approach and hang with the chandeliers, it all comes down to personal opinion and preference. Just make sure you have a clear goal in mind for what you want your dining room to say.